Get 35K SPG Welcome Points, or How to Have AMEX Match the Current Welcome Bonus Offer of 35K SPG Points--10K SPG Points (USA Only). If you have a Social Security Number, you can apply for this card (or the business version) and receive 35K SPG points upon spending $3K USD or $5K USD for the business card. Free in-room Premium Internet: Receive free in-room, premium Internet access. Booking requirements apply. Upgrade Your Status: Receive credit for 5 nights and 2 stays toward SPG elite status each year. Free Nights & Flights: Redeem Starpoints for free nights at over 1,200 hotels & resorts in nearly 100 countries and for free flights on over 150 airlines with SPG Flights - all with no blackout dates. Note: Some hotels may have mandatory service and resort charges. Enjoy Starwood's worldwide destination portfolio: Redeem Starpoints at any of Starwood's ten distinct brands including St. Regis, The Luxury Collection, W Hotels, Le Méridien, Westin, Sheraton, Aloft, Element Hotels, Four Points by Sheraton and Tribute. Global Assist® Hotline: When you travel more than 100 miles from home, you have 24/7 access to medical, legal, financial or other select emergency coordination and assistance services, including medical and legal referrals, assistance with cash wires, passport replacement, missing luggage and more. Card Members are responsible for the costs charged by third-party service providers. Purchase Protection: When something you buy breaks or is stolen, Purchase Protection can have you covered. Use your Card for eligible purchases, and your purchases can be protected from accidental damage or theft for up to 90 days from the moment you buy them. Please read important exclusions and restrictions. 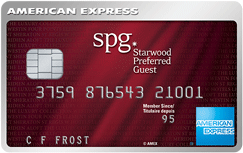 If you have recently (or even not so recently) got an SPG AMEX card in the US (business or personal), and received only 25K SPG points, call AMEX and voice your frustration, explaining that you're aware that card holders can only receive a bonus on each card once in a lifetime, and of course, you'd like to get the maximum welcome bonus possible, and considering the public offer is 35K, would they please consider matching that offer for you--if they only want to throw 1K or 3K at you, ask for a supervisor. You'll likely get them to match the offer. Get Amazon Prime (USA) tonight for $73USD! Even if you currently have Amazon Prime in the States for whatever reason, you can get it for $73 a year! If you have never had it, you have the least amount of work on your hands. Click here to get the deal. If you currently have Amazon Prime in the States, you can chat with them and ask them to please consider giving you the deal as you live in Canada and do not use the 2 day shipping option except on the rare occasion when you’re going there to the States to visit. That was what I said. They actually refunded me for my current Prime membership (after cancelling it) and then somehow made me eligible–and gave me the link through the chat system. Choose “Amazon Video” and “Prime Video” as your issue to open up the option of the chatline. That’s what I used. Why get it? If you are interested in getting an Amazon Echo device (Star Trek: The Next Generation’s computer system whereby you speak to it and it speaks back to you about a number of topics, including jokes, games, recipes, grocery lists, millions of songs from Prime music, etc. ), it’s totally cool and you’ll need Prime to get the Echo to work. They’re always adding new features to it! You’ll also need to sign up for a service such as Unblock-US.com for $50CDN a year (or $4.99CDN a month–more expensive by the month) to allow the Echo and Prime music and Prime Video to work for you on your computer, some mobile devices, and your SMART TV. You’ll want it if you go and vacation in the States or have a friend in the States to pick up items from–to ship packages there–and choose no-rush shipping for things that vary depending on what Amazon chooses to offer–$5.99 off Amazon grocery shipping (Prime Pantry) or $0.99 off videos for each order shipped (ship each one separately–they’ll put them together and give you credit for each order). ACT FAST! It ends at midnight! 25% BONUS Again For Switching Your AMEX Points to Avios!! January 13, 2016 January 13, 2016 stevesdeals Got a US "Social"? From January 12, 2016 until March 28, 2016, get 25% more Avios when you transfer your Membership Rewards® points to Avios. Terms and conditions apply. Yet ANOTHER reason to have an AMEX Gold Rewards or Platinum rewards card! HOT! Toronto to Osaka or Tokyo for $703CDN Return! December 2, 2015 stevesdeals Got a US "Social"? With an Air Canada flight along with JAL, you can now get a flight for as low as $703 (or less according to other websites) for travel between January and March 2016. Go to the ITravel website, change the currency at the top right corner to CDN$, and try the dates that suit you. Here’s one set of dates that got me $703CDN return, taxes included–Feb. 15 to the 25th to Tokyo. ITravel included a price drop guarantee as well, but who are we kidding? It won’t likely go lower! 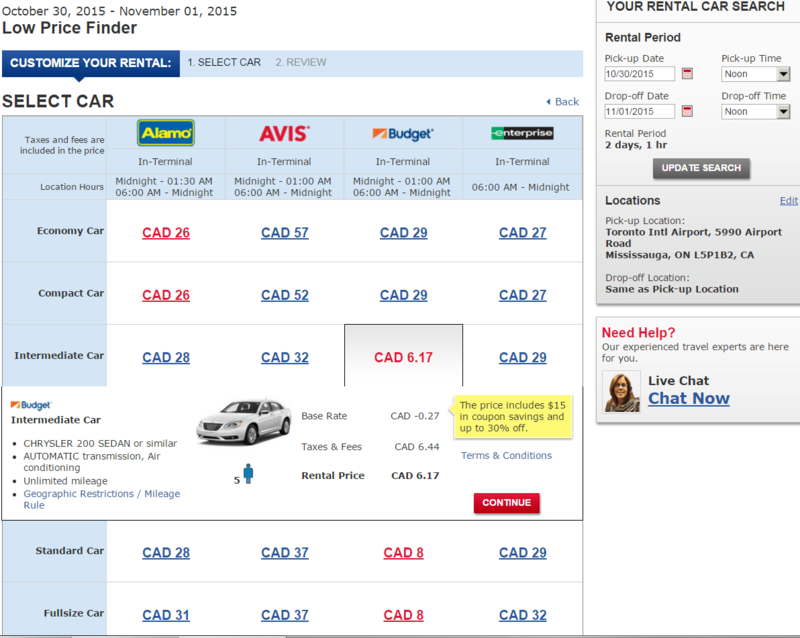 Price Mistake for Car Rentals from Costco? October 28, 2015 stevesdeals Got a US "Social"? IHG Hotel Reward Point Break Deals are OUT! October 26, 2015 October 26, 2015 stevesdeals Got a US "Social"? Every 3 months, the IHG hotel chain releases its hotels around the world that they are giving point breaks on–for only 5K IHG points (instead of 20K +), you can stay at any of the properties on this list up until January 31st for up to 2 reservations per hotel for unlimited periods of time! To get IHG points, you can transfer points from Chase (in the US) or buy/trade points through points.com or of course, get a Capital One IHG Mastercard or in the US, a Chase IHG M/C–which give at least 60K welcome points when you sign up! Once you have 5K points through one of the above ways, you can also do a trick to get points on IHG’s website, which involves getting a room at one of the hotels that is part of the 5K point break deal. You can choose to pay for it instead for $70. Get the room. It’s non-refundable, BUT they’ll give you point in lieu of the cancelled room. Insane! Hotel & Spa Mont Gabriel for $9 for July 18 or 26th!! October 25, 2015 October 26, 2015 stevesdeals Got a US "Social"? Only available for the standard king room. 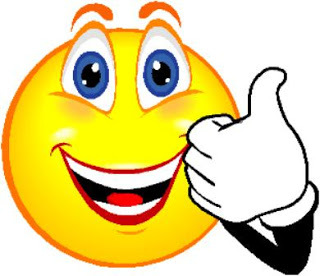 Got 4 stars from Booking.com Use this link to get to the deal before it vanishes!! October 23, 2015 January 17, 2016 stevesdeals Airline Point Posts +, Credit Card Point Posts +, Current Deals, Got a US "Social"? I’ve written before about the power of SPG points–how you can transfer the points to over 30 airlines, and do so at a premium ratio (for most airlines) when you transfer 20K SPG points (for 25K airline points). Now how will you get the points? If you click my link above, you’ll only have to spend $500 in 3 months to get 20K SPG points.Get your significant other to apply, and you can either use it to transfer to an airline point system that will take you to Seattle/L.A. Cheapest way is with Aeroplan as the conversion is 1:1 + 5K bonus Aeroplan points when converting 20K SPG points or to United points,–while they have a LOT of availability for Air Canada flights without the high taxes–unfortunately, with SPG, they only transfer at a 50% conversion (1:2). It’s unfortunately the only way I know of in Canada to earn United miles (other than RocketMiles, a website that gives you points for booking hotel stays that you can transfer to United, many other airlines, and even Amazon for gift cards. United miles are amazing in some cases. For example, YYZ-LAX for next to nothing in taxes with lots of availability. YYZ-TLV on Air Canada, for NO fuel surcharges! If you have a Social Security Number, you’d definitely want to get the Chase United Mileage Visa, that offers terrific features, along with a 50K welcome bonus (at certain times or if you already have a chunk of miles in your account–how many, I’m not sure about). If you sign up for a United Mileage card and then attempt to book a flight, you’ll see the offer going from a 30K welcome bonus to a 30K + $50 statement credit +5K more for a secondary cardholder. Ahhh, America–you gotta love their credit card offers! 40K MR Points-Clic On Pic! SPG 20K Welcome Bonus is BACK! Get Free Miles With United Mileage! Blog at WordPress.com. The Big Brother Theme.